As Walmart, Target, and every other big-box store in existence will tell you: Welcome back to school! Constant Readers of this magazine have long ago passed the age where such a sentiment is relevant, but when it comes to the blues, we could all use more education. That’s why we keep coming back, time after time, to hear and enjoy new lessons. A favorite one of mine is that as musicians release more albums, they mature and refine their art, gaining knowledge and experience. 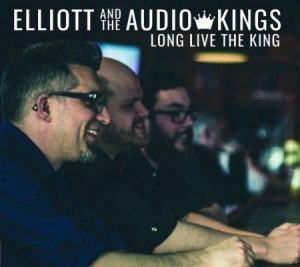 Consider Ontario, Canada’s Elliott and the Audio Kings, presenting their sophomore CD Long Live the King. As on their self-titled debut, lead man Mike Elliott continues to roar as a formidable guitar monster. However, he’s also added jalapeno-hot harmonica and more nuanced vocals. With him are stalwart trio members Jonny Sauder on drums, percussion, and background singing, and Scott Fitzpatrick on bass and background vocals. Swing and jump blues tracks (reviewed below) are sure highlights, as is their overall take on contemporary blues rock. Twelve original offerings show us that even the newest genre students can more than make the grade. The following three tracks rip and roar their way to the head of the class, all earning A’s. Track 01: “Zim Zam Zoom” – Right from the get-go, get ready to boogie. Combining a big-band swing rhythm with down-and-dirty postmodern guitar, this little ballad is about a fella whose feet fly: “There’s one thing that all the ladies know: There’s a man who knows his way around the dancefloor – zim, zam, zoom, won’t you glide across the floor?” Reminiscent of “Zoot Suit Riot” by the Cherry Poppin’ Daddies, it’s a jubilant new take on an older musical style. Track 02: “All Revved Up” – As the band dials the beat down a bit, they present a solid traditional-sounding number, calling Too Slim and the Taildraggers to mind. “Time to get out and have some fun, because you only live once, and when you’re dead, you’re done. One for the money, two for the show. 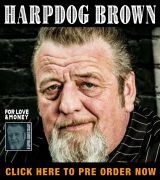 I’m all dressed up; I’m ready to go.” There’s a slick and polished veneer to this rough stomp, adding a dab of Brylcreem to what would otherwise be a hit at the rowdiest bar in town. Check out the solo in the middle, where Elliott struts his stuff once more. Track 12: “Tin Sandwich” – The title refers to a harmonica, and boy, can our front man play it. This is a musical shot of adrenaline featuring take-no-prisoners drums and blustering bass, a jolt from an exposed wire. Like bookends, tracks one and twelve are the danceable picks here. Just when you think it’s over, surprise – there’s more to come, so hold on to your hats, folks. Long Live the King! 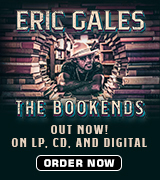 That’s what the blues really is, and sophomores Elliott and the Audio Kings pay heartfelt, hair-raising homage.